A German company has concocted a scheme by the name of ‘Games from Space’ which borrows your GPU for cryptocurrency mining purposes, and in return gives you free PC games. 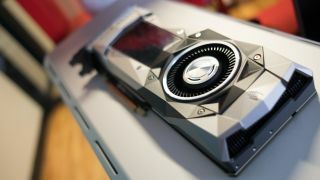 Now, obviously they’re not exactly free as such – as the use of your graphics card for mining will up your PC’s power consumption, and have a cost on your electricity bill – but nonetheless, there’s no direct cash outlay, and so this is a tempting proposition on the face of it. Particularly given that some of the games are newer big-name affairs, like, for example, PlayerUnknown’s Battlegrounds (PUBG) or Grand Theft Auto V.
To get involved, you need a Windows PC with a graphics card that has at least 3GB of video RAM. You can then pick a game you want, and watch a progress bar slowly tick up as your GPU is used for the company’s mining efforts. The faster your graphics card, obviously enough, the quicker progress you’ll make towards getting that game. On the website, you’re shown estimated timeframes of how long it will take for you to snare any particular title, based on using a GeForce GTX 1070 graphics card. For example, the aforementioned PUBG and GTA V will take you around 28 days of mining, according to the company. Older titles can be had much more quickly, of course: you can get DiRT 3 in a day. The mining application will run at full pelt if your PC is idle, and won’t interfere with the daily operation of your machine, the German firm promises. Although on the website, it suggests users can still game and mine at the same time, depending on the game being played, of course. But the overall idea is not to interfere with how well the game runs, as you would expect. Games from Space is an interesting scheme which could well be worth a whirl, and free games definitely beats the only thing we’ve ever got from space previously: namely potentially life-threatening sized chunks of rock flying at us.